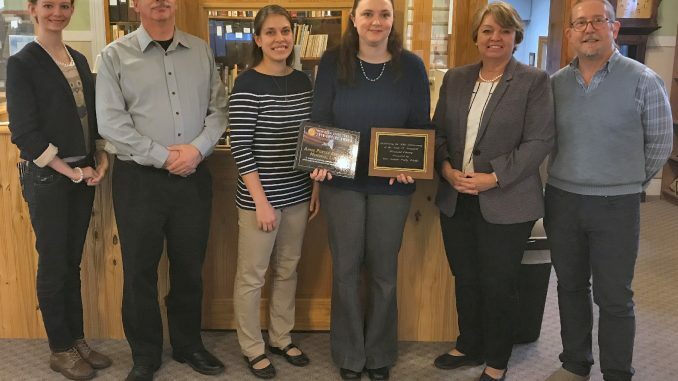 Senator Patty Ritchie is seen at the Annie Porter Ainsworth Memorial Library presenting Library Director Jessica Godfrey the 2018 “Empire Award.” From left are: Shannan Robbins, Substitute Librarian Assistant, James Horth, Library Board President, Rachel Allen, Library Board Secretary, Jessica Godfrey, Library Director, Senator Ritchie and Kevin Allard, Library Board Trustee. 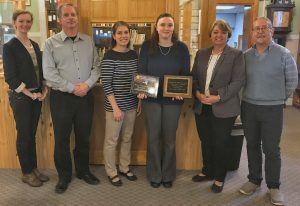 SANDY CREEK – At a recent visit to the Annie Porter Ainsworth Memorial Library in Sandy Creek, State Senator Patty Ritchie presented the library with the New York State Senate “Empire Award” for its efforts to provide educational resources and programs to the local community. In addition to carrying the important books people need and want, the Annie Porter Ainsworth Memorial Library also helps people gain the resources and skills they need to succeed in school, learn the latest in technology and find a job. For the last 30 years, the library has also received support from the “Friends of the Annie Porter Ainsworth Memorial Library”, which has worked with the library to foster important relationships with organizations such as the Sandy Creek Central School District and other local non-profits. Those partnerships have allowed the library to host more than 100 free programs each year. The Annie Porter Ainsworth Memorial Library was built by Danforth Ainsworth 90 years ago, to honor his wife, Annie. The New York State Senate Empire Award recognizes excellence in business. Its recipients demonstrate leadership in their industry, innovation, job creation, economic growth and contributions to its community.